Marianne's bike needed some serious lowering, as she was barely able to touch the ground. Especially when we replaced the low profile tire that was mounted on her bike. Also the stock Transalp suspension is a bit weak. It doesn't provided good feedback on road conditions and it just feels soggy. There was no doubt we had to upgrade the shocks. As BMW GS Club members we've been reading some very positive feedback on Hyperpro suspension on the club forum. During the winter of 2010 Hyperpro had a special offer for BMW GS club members. So we took the plunge and asked if we could have fitted progressive springs to our Transalps for the same rates. And so it happened, the guys from Werkendam fitted progressive springs to our bikes. What a HUGE difference!!! It feels like riding a totally different bike, in a positive sense that is. Sander has been using the older Mark 2 Pivot Pegz on his 1150 GS Adventure. As a matter of fact he organised a group purchase for the BMW GS Club members. He really loved those pegs, because they improved grip and caused less strain. And on the 1150 GS the pegs were considerably lower, compared to the stock pegs. So when someone organised a group purchase for the newer Mark 3 Pivot Pegz, Sander bought a set for his R100GS. The bigger Mark 3 pegs offer even more grip and are less tiring for the feet while standing because of the larger surface area. However Sander liked the smaller Mark 2 better. So they were fitted to our bikes. To avoid a bent shift lever, we installed one that folds back. And for better control while offroading we installed a brake lever extension. Both come from Touratech. For a better braking response we installed Venhill steel braided brake lines on the front. On the rear we keep the original lines, as it is well protected by the swingarm and braking power is less important while offroading. That is, if you lock the wheel, it will slide anyway. Judged from the Transalp handlebars Japanese people must be anatomically very different to the rest of the world. Or what? The original bars have a very funny angle in the section where the controls are. It just feels plain wierd and unconfortable. How could anyone have been riding with those stock bars for 12 years? They really need to go! Sander's bike got a pair of Renthal Dakar High bars fitted. Because Marianne is a whole lot smaller, the narrower Renthal RC High bars are fitted to her bike. While offroading, not having the proper rise is a pain in the ar.. uhmm back! No really it is. One should be able to stand in a comfortable upright position. As our handlebars don't offer enough rise, we had to mount handlebar risers. Normal 3 centimeter risers for Marianne and some super duper Rox risers (5 cm) for Sander. Unfortunately the tank and fairing are in the way, so they won't be able to pivot. Because Marianne broke both the clutch and brake lever of her Suzuki Bandit while dropping the bike a couple of times, we installed some aluminum reinforced Acerbis Multiplo hand protectors as a precaution for our Nordkapp trip. Probably making the Bandit one of the very few streetbikes with offroad handguards. It looked ok though and it served its purpose when Marianne dropped her bike somewhere in Finland. 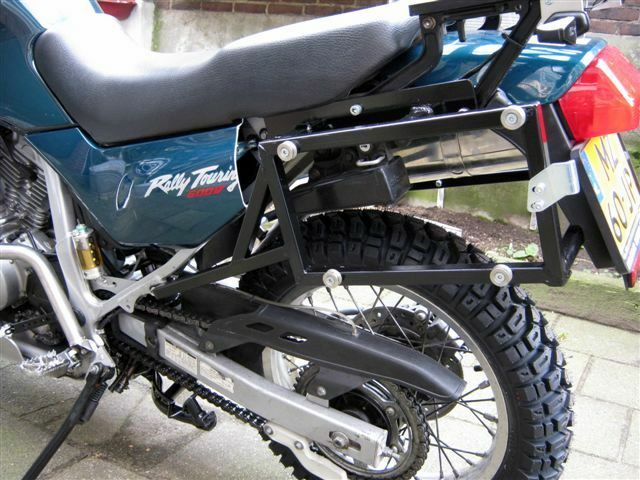 When we sold it, we took of the hand protection and reinstalled them on the Transalp. For Sanders bike we bought a couple of Acerbis Rally Pro guards, while the stock handguard are utter useless for anything else than keeping wind from your hands. A no-brainer actually, as Marianne is always having cold hands. The Daytona system was already mounted on her Suzuki Bandit, so we just reinstalled it on the Alp and bought a second one on sale for Sander. The original seat was ok. But on the long stretches resulted in sore bum. Also Mariannes seat needed a bit of lowering, as she's still having difficulty reaching the ground. In the BMW GS scene there's a few names going around for proper seat modifications, one of them is Rayz. We decided to give it a go and must admit he did quite a good job. Most of the modifications we did are well thought, but it doesn't really apply for the front fender. We could say the reason is that it is better for offroading. It catches less mud, etc. But seriously how much (extreme) offroading are we going to do after all? No it's just a styling thing. Come on! Admit it, it just looks so much better! Sander is not really a big fan of chain and sprockets and the maintenance that they involve. That's one of the reasons why all his previous bikes had drive shafts. Unfortunately the Transalp doesn't have one. So to avoid getting greasy and filthy, we've installed an Osco Oiler system on both motorbikes. One of the systems actually came of Mariannes Suzuki Bandit, where it proved itself. It's pretty straight forward. You pull the plunger, while idling in first gear and the oil drips onto the chain and rear sprocket. It's not vacuum operated, like other systems, so it doesn't provide a continuous stream of oil drops. That actually is an advantage as it doesn't over saturate the chain with oil and doesn't leak while waiting for a traffic light. The only drawback of the system is that you have to lubricate the chain more often and the oil really smells bad! Replacing the exhaust was one of the first modifications we actually had done. We wanted to keep the bikes as narrow as possible. Our aim was to keep the total width of the motorcycles, including panniers somewhere close to 90 centimeters. The same width as the handlebars and the width Sander was accustomed to, riding a BMW 1150 GS with Zega special kit. With one SW Motech Trax (45l) pannier measuring 28 centimeters in width, we somewhat had us a challenge. So our initial plan was to have, the exhaust lowered. But in the exhaust modification shop, it turned out that it was possible to reduce the total width of the bike and yet maintain a high mounted exhaust. And it even sounds better! The pannier rack project was a bit of a drama, as you can read on our blog. It all started when we wanted to keep using our SW Motech Trax panniers. But it turned out that SW Motech, doesn't make pannier racks for our old Hondas. They do so for the 650, but we didn't know if that was going to fit. Besides all pannier racks tend to be very wide, because they enclose the exhaust and are build symmetrical. So it soon was clear to us that we had to have some racks custom made. That wasn't really a problem, as the SW Motech mounting system is pretty simple and Sander already had a custom built rack for his 1150 GS. But it all went pear-shaped when we decided to give a local welder a try. As an example we gave him a set of Original SW Motech racks that came of Marianne's Bandit and the sturdy custom made rack that was on Sanders BMW. And he welded us a couple of flimsy; pretty looking racks, that didn't even fit properly. Not being very confident in the end result and pretty desperate we asked Pharaobike to weld us a couple of pannier racks. And that is how we got our set of sturdy looking pannier racks. The Honda XL600V being a bit of an older motorcycle, there isn't a lot of options if you want to protect the engine from stones, rocks, etc. In fact we managed to find only one skidplate suitable for the job. And it's from SW Motech. It's a sturdy looking aluminium bashplate, incomparable to what Honda bolted to the bottom of the bike. Although we do not plan on driving at night, we want to be prepared for the occasion when we have to. So good visibility is key and HID lamps provide it! And it does so consuming 20 Watts less power than the normal H4 bulb. Initially we were considering dual (high and low beam) HID. But it uses a mechanical system to switch between the low and high beam. This requires an extra power lead to the battery to control a servo. That's something we didn't want and we doubted if the mechanical parts and offroading are such a good combination. Also we didn't like the single point of failure. If the bulb dies for whatever reason, you're stuck with no light at all! That's why we decided to go for a HID / Halogen combination. When the low beam (HID) dies, we at least still have a halogen high beam. Besides the system is fully plug & play, so we can always convert back to a normal H4 bulb when we have to. To protect our precious HID bulbs, we need some headlight protection. It turned out nigh impossible to find a headlight protector for the older Honda Transalp. Luckely we were able to find an ad on Marktplaats (the Dutch eBay). Some Polish guy is having those protectors custom made. But unfortunately he only had one. So now we are still waiting for the second one to arrive. The regulator/rectifier being one of the weak spots of the Transalp, we wanted to be able to keep an eye on the current. For that purpose we installed a Koso Mini-3, that actually doubles as a clock and a thermometer.